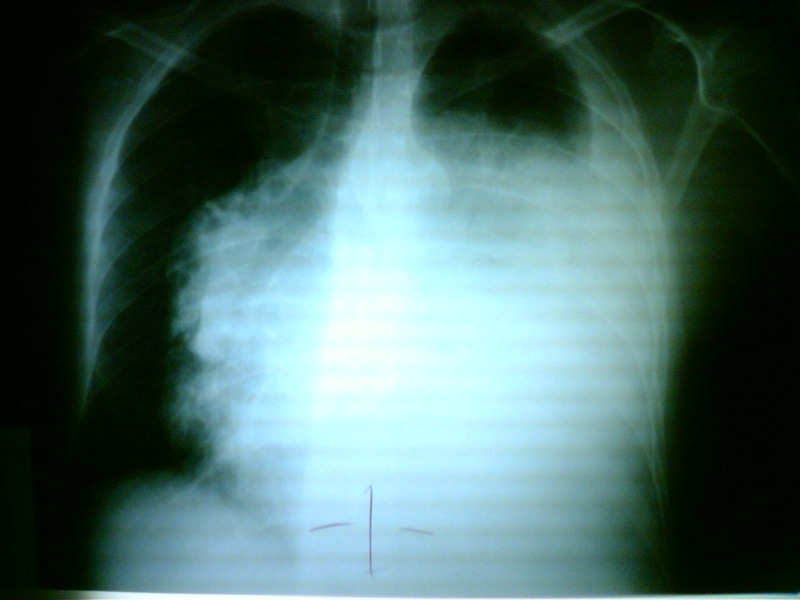 50 y/o male with a history of one year with respiratory symptoms, he was diagnosed treated at Guatemala where he lives. Now he comes to Mexico City seeking for a second opinion and other options of therapy. At the physical examination he is well, has diminished breath sounds and just sinus tachycardia. Thymic carcinoma displays distinct morphology and biology, different in many ways from thymoma. It is composed of highly atypical cells with cytoarchitectural features of carcinoma similar to those seen in other organs. Although many lymphocytes can be seen in its stroma, they are of B cell type and mature T cell type; thymic carcinoma lacks the immature T cell lymphocytes of thymoma. Thymic carcinoma is classically not associated with paraneoplastic syndromes such as myasthenia gravis. However, one study reported 22 cases of primary thymic epithelial neoplasms which showed combined features of thymoma and thymic carcinoma; the carcinoma and thymoma were either found synchronously, or carcinoma developed with a preexisting thymoma after 10 to 14 years. Incidence Primary thymic carcinoma is a rare neoplasm. 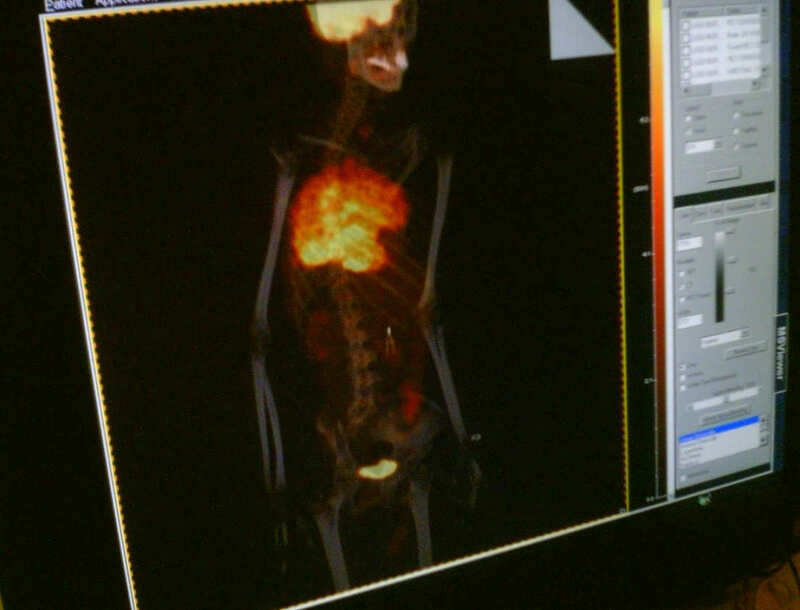 At the National Cancer Center of Tokyo, 17 cases were resected over a 29 year period, during which time 79 thymomas and 2500 lung cancers were treated. 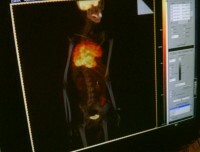 Clinical and radiographic manifestations Primary thymic carcinoma is a tumor of adulthood (mean age of 46 to 54 years). Most patients complain of chest symptoms, including pain, cough, superior vena cava syndrome, or general symptoms such as fatigue, weight loss, anorexia; fewer than 10% of patients are asymptomatic. Chest radiographs and computed tomography show an anterior mediastinal mass infiltrating along the pleura or mediastinum, with frequent necrosis or rare calcifications. No, he presented with superior vena cava syndrome. The patient was diagnosed and treated with IV QT in Guatemala, then he came to MÃ©xico city seeking for another treatment options. When I saw this patient about 4 months after diagnosis he was well except for sinus tachycardia. Did he have any myasthenia-gravis like symptoms? Next Next post: What if an earthquake destroys Tlalpan?